A lovely cookie! So pretty! This looks beautiful! I love when cookies have the sugar on them like that. Thanks for sharing. You are so right. That sugary coating really makes a cookie. It's like the best part of a muffin all surrounding a cookie. I would roll myself in sugar if I could. I am so giving these a try. ... as soon as I finish up the molasses cookies already waiting to be baked at random in my freeaer. This is probably a lot sooner than I anticipate. Those look amazing! Molasses is an amazing ingredient. Will have to make these. Such a delicious cookie - sounds wonderful with molasses flavor and a sugar coating! "roll in sugar" is a clue to excellence! Totally agree about the roll-in-sugar business. These look awesome. I love molasses cookies, I could eat a dozen of these. I have an open jar of molasses waiting to be used--can't wait to bake these! Thanks Grace! I laughed out loud at the "if it says roll in sugar, it's a winner". It's SO true. My favorite are Snickerdoodles, but these look divine! For people who don't care for molasses, use half molasses and half honey. You had me at "roll in sugar." These cookies look utterly delightful. Your mother is quite amazing. I'd like to find them in my cookie jar, even if it wasn't Christmas. Cookies with a crunchy, sugary coating are my favorite! Haha! I love AlbanyJane's comment! I would roll myself in sugar too! LOL! Great recipe! I have some leftover molasses I need to use up. Can't wait to try this. These are similar to my friends ginger cookies......so so addictive!!!!!!!!!!! So if I coat my pan in butter and sugar that will guarantee that my bars are extra delicious? Amen to cookies rolled in sugar! And to molasses. These look fantastic! Smells good to me! Now if I can only roll Himself in sugar- hehe! I love spicy cookies and if you roll them in sugar they are even better! These look mighty tempting Grace. these sound fabulous! the Kitchen Gnome has been rummaging....looking for sweets...maybe I could accommodate him with these!! They do look incredible! These look just perfect. I've tried rolling myself in sugar but it just never quite works out. mmm, I bet your kitchen smelled divine.. I love it. A crunchy, sugar coated chunk of gingerbread! Haven't made these in years, Grace. I love the spices. Hurray for Mamma-jamma! These look fantastic, Grace! I love molasses cookies...the chewy interior and crunchy sugar exterior are the perfect balance. And those spices sound phenomenal! I can smell those baking from here with all the wonderful spices and molasses. They look scrumptious! Please send me a dozen, ok? The spices do make the cookie! That cookie looks AMAZING. I would eat, like, 100 of them. Seriously. Molasses is one of those funny ingredients--I have a love/loathe relationship with it lol. Once I made this gingerbread that had WAYYY too much molasses, just one slice of bread stained my counter! However, when just the right amount of the stuff used in a recipe... it's quite magical--and these cookies are just that, especially since they're covered in sugar! They certainly yummy for the holidays, but I could easily enjoy them year-round :). Craving one with a cup of tea about now! Great looking cookies. I do like the roll in sugar. Everything should be rolled in sugar. Mmmm...sugary bliss! What great looking cookies! Roll in sugar. Okay. Wait you mean the cookie not me! Phew I was about to dive in LOL Love love molasses so right away these cookies are a winner for me. I've been looking for a new molasses cookie recipe...not totally happy with my current one. this one looks great! I don't like molasses either. Even the smell is so awful but they do look like pretty cookies, rolling in sugar always helps. For what it's worth, I completely agree with you, "roll in sugar" typically indicates a winner! Plus, it's a step even the little ones can pull off AND it helps get them interested in baking. Oh yes, they must be rolled in sugar! molasses isn't my favorite flavor either, but my MIL made these delicious treats and they are to die for....your photo captures their beauty perfectly, Grace! Yes, they are beautiful, and yummy. I will try making these this weekend. They look yummy! You've convinced me that I need to start rolling more things in sugar, STAT. I don't think I've ever rolled anything in sugar, I have some catching up to do! Your comment made my day... thanks Grace! Looks like a treat not to be missed. Of course, even if you did nothing more than whisper the words molasses + cookies, I would've been sold. 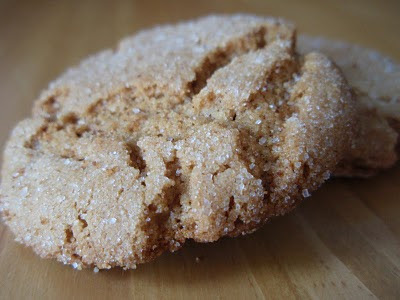 Mmm.. my mom makes a gingersnap cookie similar to this. It's one of my favorites as well. I love the crackle they have once baked. Now if only I could find molasses! Beautiful photos! I bet the cookies are great. I'm also not crazy about molasses. I just had to buy some for a barbeque sauce and I really don't like the smell or flavor, but it must add something magical to the cookies! Oh that's pur-tee. Love it. Ooh, yes these are certainly magical! Sugar, bring on the sugar baby. Mmmm... I've got some molasses in the pantry that's been neglected for a while. Might be time for cookies!! I LUV molasses cookies. Someone was doing a poll on one of the other blogs and asked what the favorite is. I voted molasses. Hmmmm, hmmm good. These molasses cookies look really good! It is not possible, that only one would hit the spot. Nice!!! Grace, you're just the cutest. Hope to meet one day! You've got me heading toward the pantry to check on my molasses supply. These look superb! Have you tried subbing butter for part or all of the shortening? I'm curious how that affects the cookies because I'm not such a fan of shortening. These are some good lookin' cookies! It's definitely the sugar which caught my attention! They look so good! I completely agree about the sugar rolling :) I've actually never made molasses cookies but should because these look fabulous! LOL Oh my gosh... that first line totally cracked me up today!! Great looking recipe my dear! Hey it's our gingersnaps! 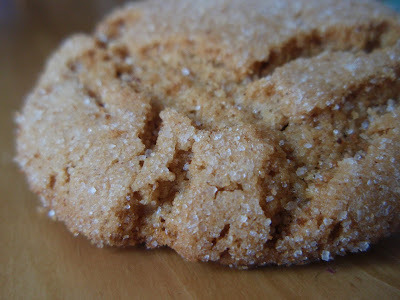 And I agree--not normally a molasses fan, but it is heaven in this cookie. They look great! I should try these, because I, too, don't usually love molasses. I can't say that I've ever made a baked good that called for melted shortening.How interesting. Does this give it a different texture, perhaps? Truly, Grace, you are wise. Rolling in sugar certainly does make most cookies better. My mom also makes molasses cookies, and I'm a big fan as well. Love Molasses cookies! They look delish!